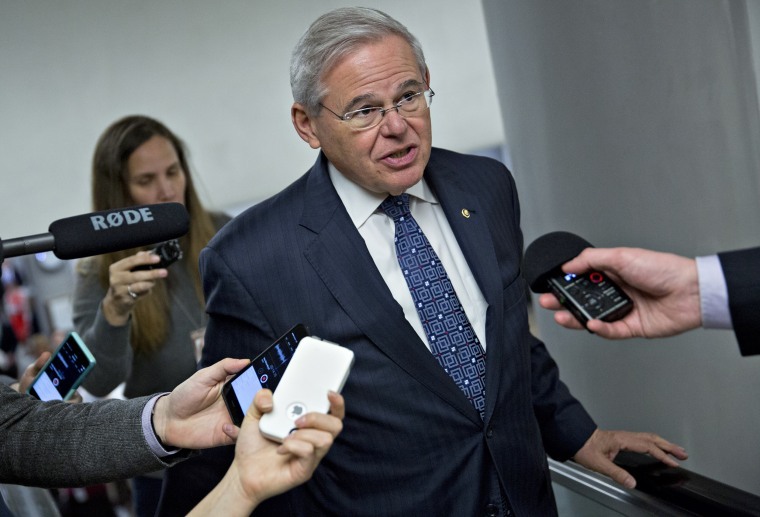 NEWARK, N.J. — Prosecutors in the bribery trial of U.S. Sen. Bob Menendez and a wealthy friend showed jurors emails Tuesday showing the New Jersey senator's staffers getting involved in the friend's multimillion-dollar Medicare billing dispute. The dispute, which ultimately cost Florida eye doctor Salomon Melgen $8.9 million, is one of the central facets of the indictment against the two men. The government charges Menendez accepted free flights and luxury hotel stays from Melgen in exchange for lobbying government officials on behalf of Melgen's business interests. Some of the emails shown to jurors Tuesday dated back to 2009 and included communications between Menendez's staffers and Melgen's lawyers as well as with an attorney for the Center for Medicare and Medicaid Services. The indictment alleges the Democratic senator's subsequent contacts with health officials — including 2012 meetings with then-Health and Human Service Secretary Kathleen Sebelius and acting Medicare administrator Marilyn Tavenner — were meant to benefit Melgen, who had given hundreds of thousands of dollars to campaign funds that supported Menendez's re-election that year. Menendez has argued in court filings that he was concerned Medicare reimbursement policies were unfair and enriched drug companies at the expense of doctors. On cross-examination, several witnesses testified Melgen's name wasn't mentioned at the meetings. The trial is in its sixth week. The prosecution is expected to rest its case next week.